Faithful friends, I apologize for the long time between entries! Andrea and I have been busy being novices. As I explained in my last post, Novitiate is a special, sacred year in the formation period of a religious. Because of the year's focus on prayer and a deepening relationship with God, I won’t be online as much and will rarely reply to emails. I still love reading comments, though, so feel free to send them along! Let me catch you up on the first two months of Novitiate. Just call me Sister Freshman. I had a dream while on retreat in July that I was moving into the dorm room I lived in as a college freshman. 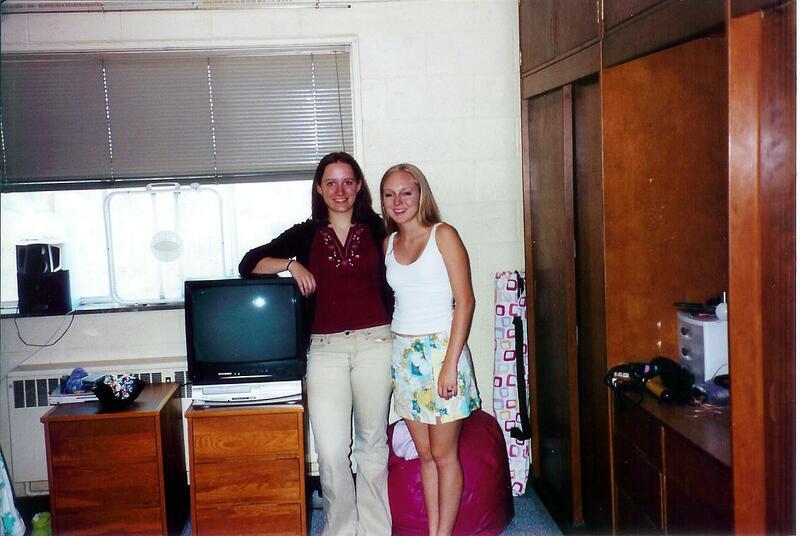 How could I ever forget Room 793 in University of Dayton’s Marycrest Hall? 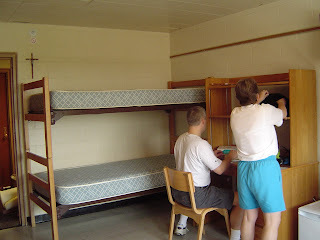 It’s where I cried when Mom and Dad left to go home to Cincinnati after move-in weekend and I stayed in Dayton; where my roommate Elizabeth and I danced to Disney music to remain sane during long hours of studying; where the RA’s wrote us up for having alcohol in the room the weekend before final exams. 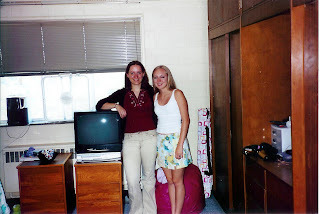 Oh yes – lots of living and learning happened in that room. Mom and Dad helping me move in to Room 793. Clearly I am being very helpful. 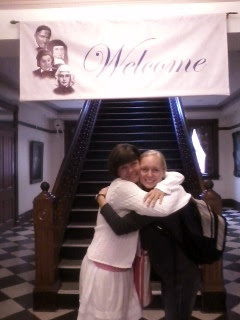 I thought that I was prepared for the transition back to Ohio and into Novitiate. I’ve moved a lot in the last few years and lived with many different people both in college and after. 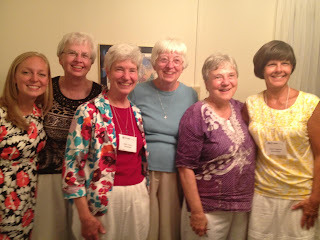 I’ve been looking forward to Novitiate year. And although I haven’t lived here for about ten years, I’m back in my hometown. But I was reminded again just how difficult transitions can be. It surprised me, like that time I was running from third to home in junior high softball. On an easy jog in to score while the ball was still in the outfield, I tripped over my own feet. It seemed like I was falling for minutes until I landed on home plate almost face down. I was happy I made it but certainly hadn’t planned on the stumbling involved in the arriving. “I just feel so unsettled!” I told my retreat director, and he smiled playfully. I suppose the gift of feeling unsettled is the chance it gives us to rely on God and to test out the wings of faith. As novices, Andrea and I are invited to turn to God as the primary relationship in our life. The loss of solid ground to stand on forces me to find my footing in God and remember, again, to trust. It is a time for deeper discovery of who God really calls me to be – the authentic self at my core that doesn’t change no matter how much my surroundings do. It is a time to be fully in the present and to come to know the voice of the Good Shepherd that guides us through straight paths and treacherous terrain. It’s a moment to practice living one day at a time, which is how the “upperclass” Sisters tell us they have made it through. And the blessings are abundant. With each passing “one-day-at-a-time,” the surroundings are evolving into “home.” Andrea and I have been novices for two months now. Our house community of Carol, Maureen, Nancy and Terry as well as our Director, Donna, have been wonderfully supportive to us. We’ve felt the Sisters of Charity love from all of the other dear Sisters, Associates, and staff. We’ve had a chance to spend time with more of them (and we’ve learned more names). It's been a joy. Our classes and seminars are in full swing. We have learned much about the history of our congregation and about the many good works happening in Cincinnati. We’re exploring the community virtues and studying Vatican II. We’ve also both chosen the place that we’ll do volunteer ministry one day a week. I’ll be working with S. Barb Hagedorn at Good Samaritan Free Health Center in Price Hill, a diverse, historic area of town with many people in need. It feels good to have a more regular schedule in place and exciting to have so many inspiring experiences. The excitement, of course, is the flip side to the freshman jitters. It is thrilling to enter more fully into the life of the congregation. The more I learn about who these Sisters have been, what they have done, and how powerfully they have touched lives, the prouder I am to become one! It is thrilling to dream about the future and wonder where Andrea and I might be in twenty years and who might be with us. It is thrilling to be welcomed into this legacy of being urged by Christ’s love started by Elizabeth Seton over 200 years ago. We are so grateful to all those walking with us. Elizabeth. Can you guess where? In July, S. Judy Metz, the community archivist and historian, led Andrea, Donna, and I on “The Way of Elizabeth,” a week-long pilgrimage to the significant places in Elizabeth Seton’s life. She grew up an Episcopalian in New York City at the outset of the American Revolution and ended up founding the Sisters of Charity in Emmittsburg, Maryland, in the early 1800’s. In between, she was a wife, mother of five, widow and convert to Catholicism (read her story here). After her death from tuberculosis at age 46, the small community of Sisters of Charity that she started continued to grow, and her influence flourishes today all over the world. She was canonized in 1975. As we walked her footsteps, I was struck by Elizabeth’s faith. Yes, she is a Saint, but my goodness, was she human! She would probably have been dumbfounded to know that one day she would be canonized. I am sure she felt like a freshman many times. Now, we can see the whole picture, but she had no idea what would be in store around the next corner. At each step of the journey, she simply said “Yes” to what God placed in front of her. She took risks and found her footing on the solid ground of Grace. As a freshman in Marycrest 793, I could never have guessed the great blessings that would flow from my years at UD or where it would take me. Thank God I stayed through the tough, “unsettled” times. Now, a “freshman” in a different way, I am invited again to trust the journey.